Dehydration occurs when you use or lose more fluid than you take in, and your body doesn’t have enough water and other fluids to carry out its normal functions. If you don’t replace lost fluids, you will get dehydrated. The most common cause of dehydration in young children is severe diarrhea and vomiting. Older adults naturally have a lower volume of water in their bodies, and may have conditions or take medications that increase the risk of dehydration. This means that even minor illnesses, such as infections affecting the lungs or bladder, can result in dehydration in older adults. Dehydration also can occur in any age group if you don’t drink enough water during hot weather — especially if you are exercising vigorously. You can usually reverse mild to moderate dehydration by drinking more fluids, but severe dehydration needs immediate medical treatment. Thirst isn’t always a reliable early indicator of the body’s need for water. Many people, particularly older adults, don’t feel thirsty until they’re already dehydrated. That’s why it’s important to increase water intake during hot weather or when you’re ill. The signs and symptoms of dehydration also may differ by age. Sometimes dehydration occurs for simple reasons: You don’t drink enough because you’re sick or busy, or because you lack access to safe drinking water when you’re traveling, hiking or camping. Diarrhea, vomiting.Severe, acute diarrhea — that is, diarrhea that comes on suddenly and violently — can cause a tremendous loss of water and electrolytes in a short amount of time. If you have vomiting along with diarrhea, you lose even more fluids and minerals. In general, the higher your fever, the more dehydrated you may become. The problem worsens if you have a fever in addition to diarrhea and vomiting. Excessive sweating.You lose water when you sweat. If you do vigorous activity and don’t replace fluids as you go along, you can become dehydrated. Hot, humid weather increases the amount you sweat and the amount of fluid you lose. Increased urination.This may be due to undiagnosed or uncontrolled diabetes. Certain medications, such as diuretics and some blood pressure medications, also can lead to dehydration, generally because they cause you to urinate more. Infants and children.The most likely group to experience severe diarrhea and vomiting, infants and children are especially vulnerable to dehydration. Having a higher surface area to volume area, they also lose a higher proportion of their fluids from a high fever or burns. Young children often can’t tell you that they’re thirsty, nor can they get a drink for themselves. 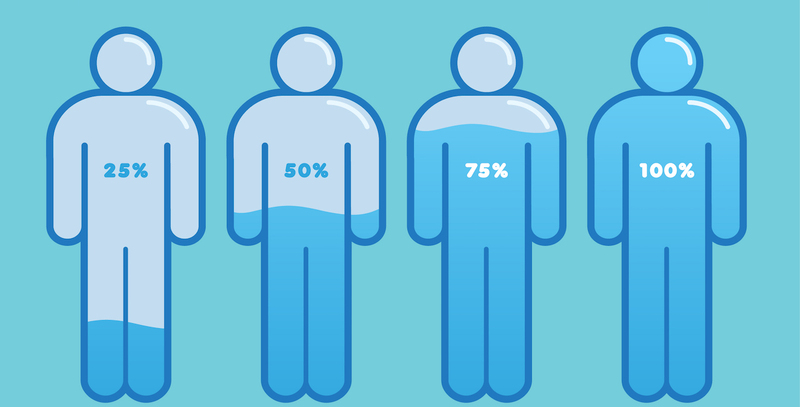 Older adults.As you age, your body’s fluid reserve becomes smaller, your ability to conserve water is reduced and your thirst sense becomes less acute. These problems are compounded by chronic illnesses such as diabetes and dementia, and by the use of certain medications. Older adults also may have mobility problems that limit their ability to obtain water for themselves. People with chronic illnesses.Having uncontrolled or untreated diabetes puts you at high risk of dehydration. Kidney disease also increases your risk, as do medications that increase urination. Even having a cold or sore throat makes you more susceptible to dehydration because you’re less likely to feel like eating or drinking when you’re sick. People who work or exercise outside.When it’s hot and humid, your risk of dehydration and heat illness increases. That’s because when the air is humid, sweat can’t evaporate and cool you as quickly as it normally does, and this can lead to an increased body temperature and the need for more fluids. Heat injury.If you don’t drink enough fluids when you’re exercising vigorously and perspiring heavily, you may end up with a heat injury, ranging in severity from mild heat cramps to heat exhaustion or potentially life-threatening heatstroke. Urinary and kidney problems.Prolonged or repeated bouts of dehydration can cause urinary tract infections, kidney stones and even kidney failure. Electrolytes — such as potassium and sodium — help carry electrical signals from cell to cell. If your electrolytes are out of balance, the normal electrical messages can become mixed up, which can lead to involuntary muscle contractions and sometimes to a loss of consciousness. Low blood volume shock (hypovolemic shock).This is one of the most serious, and sometimes life-threatening, complications of dehydration. It occurs when low blood volume causes a drop in blood pressure and a drop in the amount of oxygen in your body. To prevent dehydration, drink plenty of fluids and eat foods high in water such as fruits and vegetables. Letting thirst be your guide is an adequate daily guideline for most healthy people. Vomiting or diarrhea.If your child is vomiting or has diarrhea, start giving extra water or an oral rehydration solution at the first signs of illness. Don’t wait until dehydration occurs. Strenuous exercise.In general, it’s best to start hydrating the day before strenuous exercise. Producing lots of clear, dilute urine is a good indication that you’re well-hydrated. During the activity, replenish fluids at regular intervals and continue drinking water or other fluids after you’re finished. Older adults most commonly become dehydrated during minor illnesses — such as influenza, bronchitis or bladder infections. Make sure to drink extra fluids when you’re not feeling well.